Effective communication helps us better understand a person or situation and enables us to resolve differences. It also allows us to build trust and respect, and create environments where creative ideas, problem solving, affection, and caring can flourish. Trust is the foundation of all good relationships and friendships. 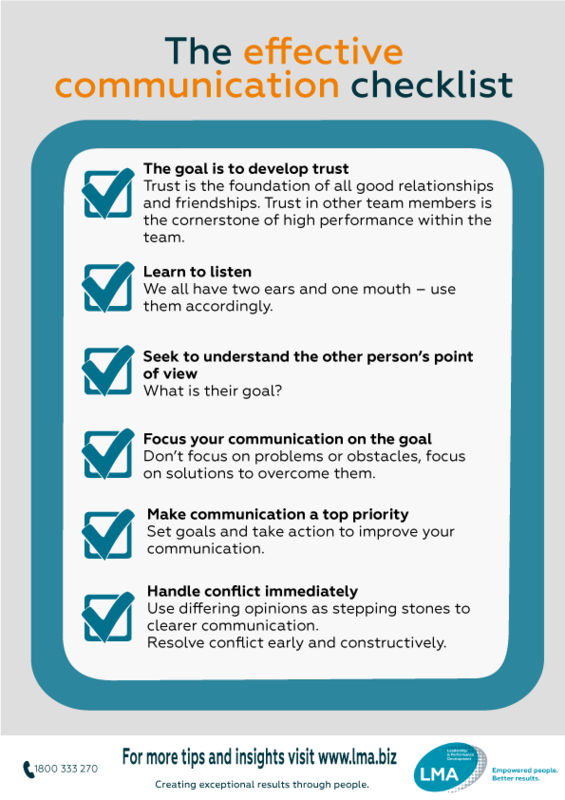 Trust in other team members is the cornerstone of high performance within the team. We all have two ears and one mouth – use them accordingly. Your endeavours should result in mutual understanding, this does not necessarily mean agreeing with the other person, rather it’s appreciating and respecting their situation or point of view. Discuss “how things can be done” rather than “why they can’t”. Don’t focus on problems or obstacles, focus on solutions to overcome them. Use differing opinions as stepping stones to clearer communication. Resolve conflict early and constructively. Set goals and take action to improve your communication.